NOTE: This is Part 3 in a series on booting Ubuntu from an iSCSI disk. We have previously created an iSCSI disk and connected to it from the Ubuntu Live installation CD. View all of the sections here. Many of the commands in this post were taken from http://etherboot.org/wiki/sanboot/ubuntu_iscsi. If you’re following along with the series, you are now on the first screen of the Ubuntu installation wizard and the iSCSI disk has been connected to your system. You can now continue the installation as normal. When you get to the disk selection screen, the iSCSI drive should show up as a normal drive; partition it as you like. NOTE: After the installation completes, and before you reboot, we have a few more steps to complete. DO NOT REBOOT! At this point if you rebooted, the boot process would fail with a message indicating that you don’t have a hard drive. If you are not a good listener and decided to reboot anyway, all is not lost. 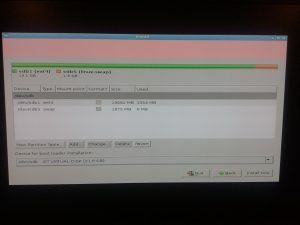 Simply boot to any Ubuntu live disk and follow the instructions in the previous post to connect to the iSCSI drive. Update: Users in the comments indicate you also need to run the following before you run the chroot command. YMMV. Now that we have switched from the live system to the system installed on the iSCSI disk, we need to install some packages. Next, we’ll want to add iSCSI to the list of modules to include in the boot image. Setup the initiator’s unique ID with the following command. You’re welcome to use a different name, however, it must follow the same naming convention as before and cannot be the same as the name of the iSCSI disk itself. If, for some reason, you decide to allow multiple clients to connect to the iSCSI disk, each client computer will need its own unique ID. Touch the indicator file, so that the module is included in the new initrd. There are still a couple of items to clean up before we are ready to reboot. If the networking systems try to renegotiate an IP address, our connection to the iSCSI device will be lost and bad things will happen. So let’s switch the network configuration to manual. Lastly we need to update GRUB to pass the iSCSI parameters to the kernel at boot time. 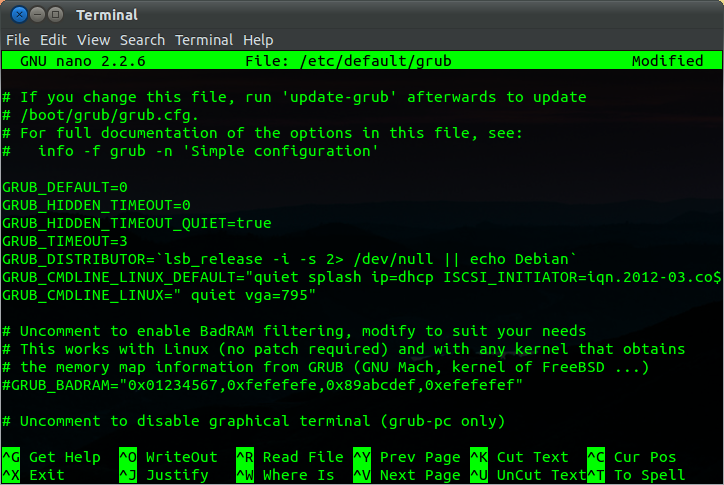 Append the following to GRUB_CMDLINE_LINUX_DEFAULT, substituting the appropriate values. Update GRUB to lock in the changes. Now Ubuntu’s boot process is configured to boot over iSCSI, but we still have to setup iPXE to get the boot sequence started. I am using ubuntu 10.10 x64 and booting of an intel iBFT nic. When ubuntu attempts to load, it drops to the busy box and says it timed out waiting on the root drive. Are there any hard drives/USB drives installed in the client machine? If so, when you change to the new system, i.e. when you mount /dev/sda1 on /mnt/newsystem, you need to confirm that /dev/sda1 is your iSCSI disk. You can type “fdisk -l” at the command line to list some basic information about each of the drives you have attached to the computer (Note: this must be run as root/sudo). If you haven’t done anything else with your system, you should be able to boot any ubuntu live CD and type these commands. If it’s still not working, I would be interested in seeing the output of the “fdisk -l” command as well as “df -ah”. Note: verified using 12.04 64bit workstation. you now need to add the resolvers manually. With trusty I also needed to run ‘grub-install /dev/sdf’ (sdf is my iscsi disk during install, the machine is not diskless). The module is called iscsi_tcp instead of iscsi in trusty.